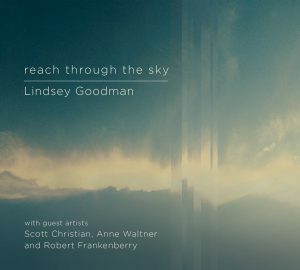 Lindsey Goodman is known for her “generous warmth of tone and a fluid virtuosity” (Charleston Gazette), and for her “impressive artistry” (Tribune-Review), “agility, and emotion” (Pittsburgh Post-Gazette). Renowned for her “brilliant”, “bravura performances” (Tribune-Review) “played with conviction” (New York Times), “flair, and emotion” (Gazette), Ms. Goodman is in high demand as a soloist, chamber collaborator, orchestral musician, teacher, and clinician around the country. A strong advocate for living composers and electroacoustic or interdisciplinary works, Lindsey is an active commissioner of new pieces, having given over ninety world premieres, including thirty-four solo and chamber commissions. Ms. Goodman has performed solo or chamber concerts, taught masterclasses, and/or given presentations at over thirty colleges and universities, performed as flute and/or vocal concerto soloist eleven times, been featured on radio broadcasts in four states, performed at multiple National and Canadian Flute Association conventions, and can be heard in solo, chamber, and orchestral performances on the Albany, New World, Navona, and New Dynamic labels, among others. Lindsey is solo flutist of the Pittsburgh New Music Ensemble, principal flutist of the West Virginia Symphony Orchestra, and adjunct lecturer at Marietta College and West Virginia State University. 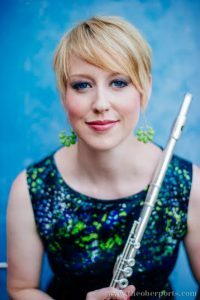 Ms. Goodman is co-founder of ASSEM3LY, a dynamic trio of flute, percussion, and piano commissioning the works of our time, Chrysalis, a transformative duo for singing flutist and singing pianist, and Leviathan, a flute, cello, and piano trio with a passion for extended musicianship and female composers. a confusing word frequently attached to new music concerts with electronics. Electronic music began in the 1940s and 1950s with the Groupe de Recherches Musicales in Paris, the Nordwestdeutscher Rundfunk studio in Cologne, and the Columbia-Princeton Electronic Music Center in New York, where composers like Pierre Schaeffer, Karlheinz Stockhausen, and Milton Babbitt were initially interested in musique concrète, computer music, tape music, and other purely-electronic musical forms realized without live-performer participation. By the 1960s, composers started putting the “electro-“ and the “-acoustic” together (because computers don’t know when they’re having fun), and the first pieces for flute and technology, like Mario Davidovsky’s Synchronisms No. 1 (1962) and Thea Musgrave’s Orfeo 1 (1975) and Narcissus (1987), were written using electronic sounds, tape, and digital delay processes. Since then, technological breakthroughs and composers pushing boundaries for both instruments and computers have reinvented the electronic music world multiple times over, making electroacoustic music one of the most fascinating 21st-century musical mediums. Why should a humble flutist using Boehm technology from 1847 care? Simple: In accessing this article on your laptop or tablet, you’ve interacted with technology, and the Daily Mail’s October survey found that people check their smartphones in excess of 85 times per day. Technology is imbedded in every aspect of our lives, so our music-making should reflect that. (If Mozart were alive today, he’d have thousands of Twitter followers and be a Max/MSP rockstar). What are the electroacoustic options? Flutists don’t have to be software-programming geniuses to integrate technology. Let’s explore 3(.5) electroacoustic options to get your next performance plugged in! Over the years, this sub-genre of electroacoustic music has been called tape music (because composers literally cut and spliced pieces of tape), soundtrack, and even boombox pieces, and performing is a easy as playing along with a favorite recording. 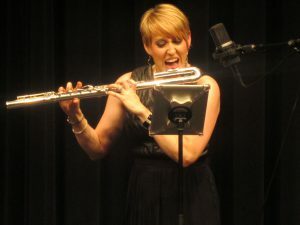 The accompaniment never changes, giving flutists the opportunity to both practice extreme consistency and to discover new ways of infusing each performance with innovative interpretation, so that, when you hit that hard lick just right with the track, you feel like a super hero. Reverb has been utilized in electroacoustic flute music since Musgrave’s Narcissus, and has come a long way since being performed with a machine pedaled by the flutist. Today, many software platforms make realizing digital delay and reverb effects easy with most laptops and a good microphone. We love the way our iPhones respond to our spoken requests (try: “beatbox for me, Siri”), so make your laptop respond to your flute! Composers use software programs like Max/MSP, Pure Data, Audacity, and Ableton Live to capture the flute sounds and process them into real-time accompaniments which respond to individual interpretations, letting you make chamber music with your computer! Excited but nervous, you’re eager to dip your toe into the electroacoustic ocean, but do you need a lot of equipment and know-how? Not as much as you think! Check out how to perform electroacoustic music in “lite”, “regular”, and “full fat” versions! To perform fixed media pieces in venues with either a CD player or USB connection hard-wired into the house sound system, it’s as easy as having someone off-stage press play on the CD or audio file off your favorite device! Many house sound boards also have reverb options built in, so that, with the help of an audio engineer, some reverb works will also be accessible. 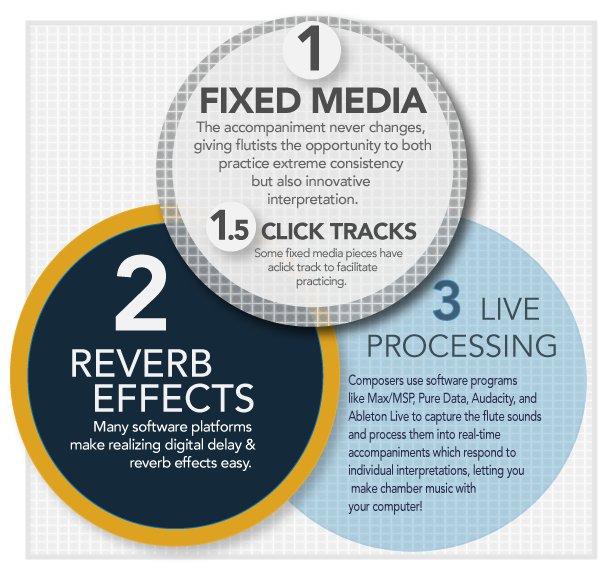 Most composers expect that live-processed pieces will be performed with the assistance of a separate technician, so track down a specialist in your area, asking the composer for resources! For fixed media pieces, take things a step further by plugging a good-quality condenser microphone on a boom stand into the house system, quickly allowing the flute to become part of the electronic world. 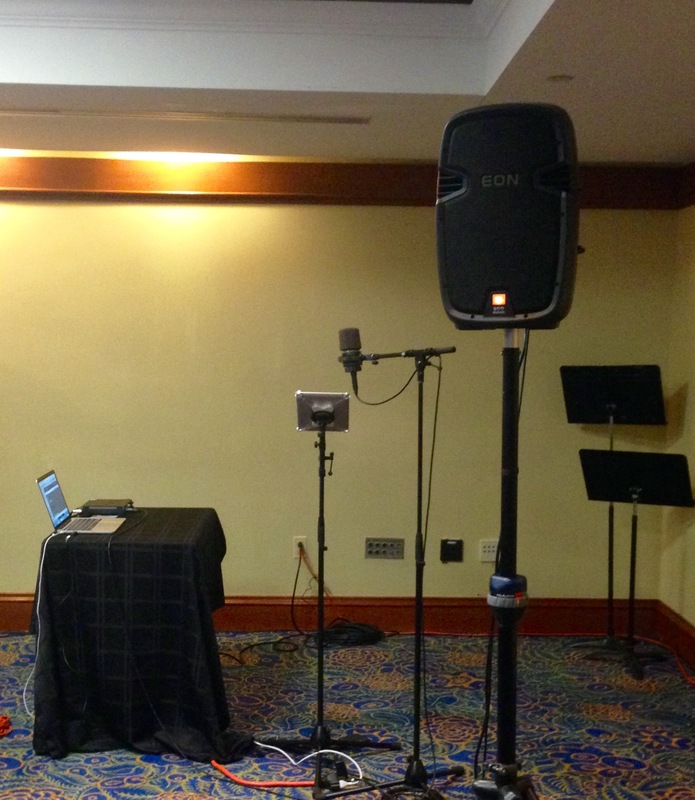 Don’t want to rely on varying house sound systems and technicians in different performance venues? Performing with all of your own gear is surprisingly easy and freeing (and it’ll fit in the trunk of most sedans)! Start with your own speakers on stands to send sound to your audience on the right and left at ear-level (two works for all but four-channel pieces, and even those can be partially realized without four units), use an audio interface to connect your laptop to the speakers and microphone(s) with XLR cable, fire up your software for playback, live-processing, and/or reverb, enlist the help of a friendly pair of ears in the hall to set balances, and you’re a one-flutist band! First, find some repertoire that speaks to you! My current repertoire list of commissioned and pre-existing pieces is a jumping off point, including information on the format, performance and technological requirements, inspiration, and video links for each work, and, if you want even more, Sarah Louise Bassingthwaighte’s online electroacoustic compendium is up to 620 compositions! Next, invest in any gear you’ll need, using my equipment list as a start (See Lindsey’s equipment gallery at the bottom of this article). Most electroacoustic pieces can be performed with just a microphone, boom stand, audio interface, laptop, and a house speaker system, so begin small, and grow your collection as your interest develops, adding speakers, footpedals, and other hardware as needed. As an electroacoustic performer for a decade, I’ve learned that it takes a lot of strength both to haul tech equipment and to supply “intestinal fortitude” for working with sometimes-unpredictable technology, but the medium is incredibly liberating and engaging. Performing a wide variety of individual works and full recitals completely solo and standing on the cutting-edge intersection of art and technology is exhilarating, so stop surfing the web with your laptop, and start making music with it! 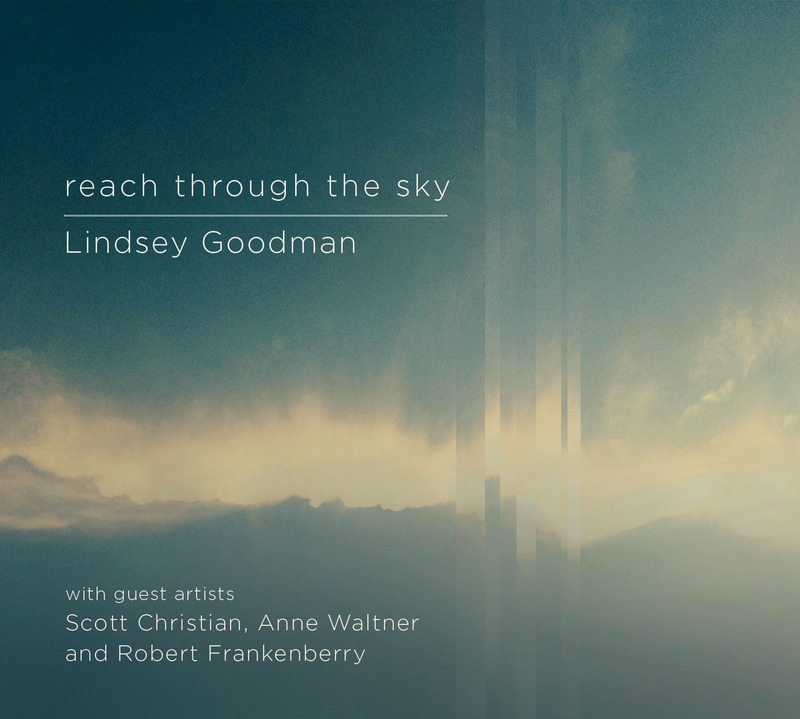 Lindsey Goodman’s debut solo CD, reach through the sky, was released on New Dynamic Records April 17th. The album is available through iTunes, CD Baby, Google Play, or her label’s Facebook page. Right on, Lindsey! Careers like yours were what we dreamed about back in the day and its GREAT to see and hear you out there doing it! Thank you so much, as that means the world to me coming from you!